The traditional and folk dances of Goa are very fascinating to watch. 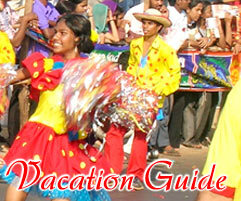 Check out information about Goan dance. When one talks about the dances of Goa, your imagination tends to stop at people dancing to trance and techno music. In case you didn't know, the Goan dances extend much beyond those rave late night parties at beaches. The traditional dance of Goa gives a picture of the mindset and lifestyle of Goans. They reflect the rich historical and cultural legacy that Goa abounds in. Goa has a unique amalgamation of different cultures and the Goan dances portray this blend of different faiths very beautifully. 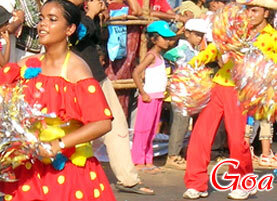 Some very popular folk dances of Goa are Dhalo, Dekhni, Fugdi, Shigmo, Kunbi, Lamp Dance, etc. 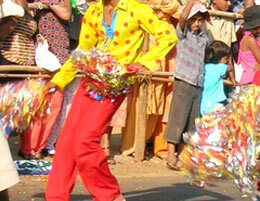 One of the most popular dances of Goa is the Dhalo. It is one of the choicest dances of the women dwelling in rural Goa. In this dance form, young girls and women form a semi circle by joining their hands behind each others waists. They then sway in coordinated movements to beats of rural musical instruments and music. It is a dance full of fun and frolic. The Dekhni is basically the traditional dance of those Christians who converted to Christianity from Hinduism during the Portugal rule. These people were the ones to compose this traditional dance form of Goa. The dance also involves singing by people. It usually begins with a beautiful lady starting the dance and is joined later by other dancers gradually. The music of this dance is a lovely combination of rhythm and melody of both western and Indian genre. The Fugdi is a traditional dance of Goa that is quite popular among the womenfolk of Goa. This dance is devoted to the Hindu Elephant God, Lord Ganesha. This dance can be performed on any occasion and does not require any particular festival to be performed. One of the most common dances that is performed in Goa, this dance requires continues swirling until one gets exhausted and sits down. The Shigmo is a traditional dance of Goa and is performed during the advent of spring season. For farmers, this dance is symbolic of regeneration of their natural resources. This dance is also performed when soldiers return from the battlefield victorious in their mission. This dance is performed mostly during the month of March when temples are decorated lavishly to celebrate the spring festival. One of the earliest folk dances of Goa is the Kunbi dance. This dance was mainly performed by the earliest settlers of Goa known as the Kunbis. The dance has more of a social element in it rather than a religious feeling. The dance is performed by the women dancers who perform this dance very elegantly at quite a fast pace. Their traditional attire adds the color to this dance form. The Lamp Dance is called so because of the brass lamps that is used to perform this dance. The dancers have to dance very slowly balancing heavy brass lamps on their heads. The music is usually instrumental and folk instruments like Ghumat, Samael, Cymbal and Harmonium are used. This dance requires immense amount of self control and discipline in order to balance the lamps and dance.